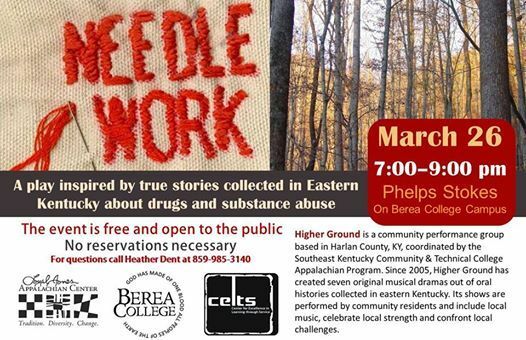 Join us for a play by Higher Ground about drugs and substance abuse inspired by true stories from Eastern Kentucky. Higher Ground is a community performance group based in Harlan County, KY, coordinated by the Southeast Kentucky Community & Technical College Appalachian Program. Since 2005, Higher Ground has created seven original musical dramas out of oral histories collected in eastern Kentucky. Its shows are performed by community residents and include local music, celebrate local strength and confront local challenges.